Elections | Park View, D.C. 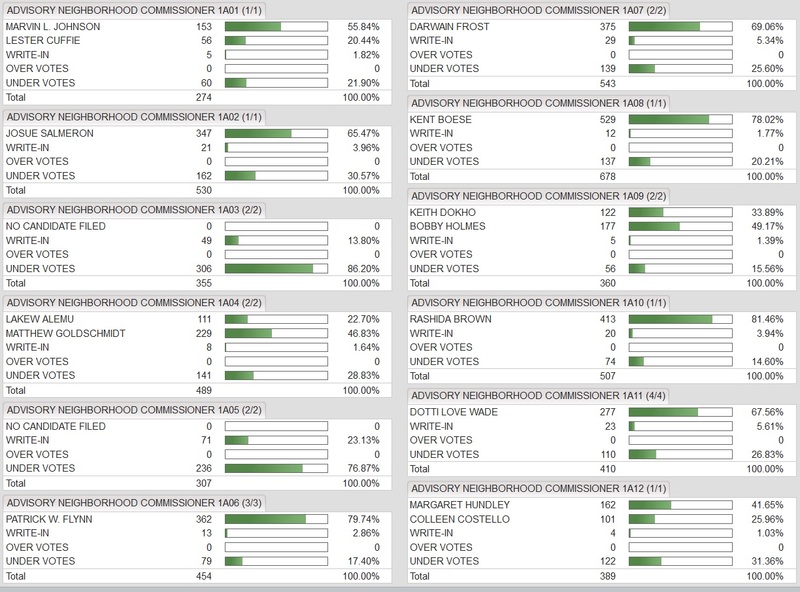 While the national election results were a huge surprise this morning, at the hyper-local level Park View will continue to be represented on Advisory Neighborhood Commission 1A by Commissioners Kent Boese, Bobby Holmes, and Rashida Brown (full election results here). Because Single Member District 1A11 had no candidate on the ballot, it is too early to know which of the two write-in candidates won. 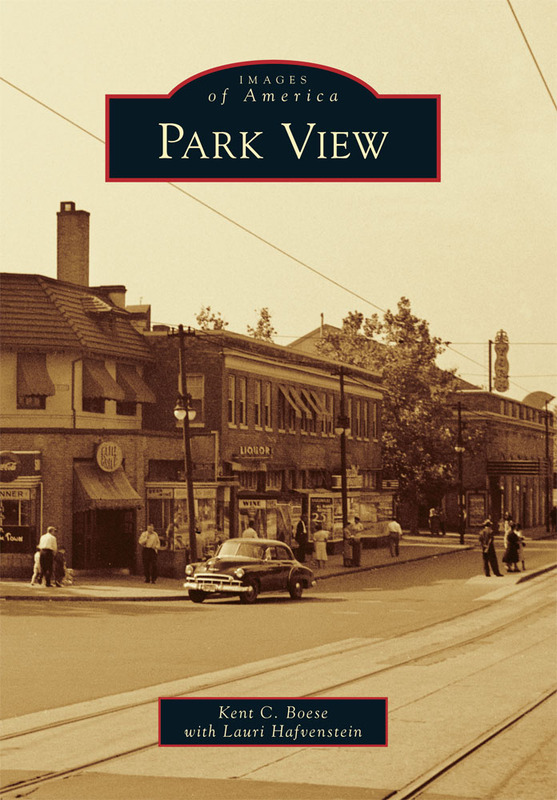 Below are the results for the Park View area. 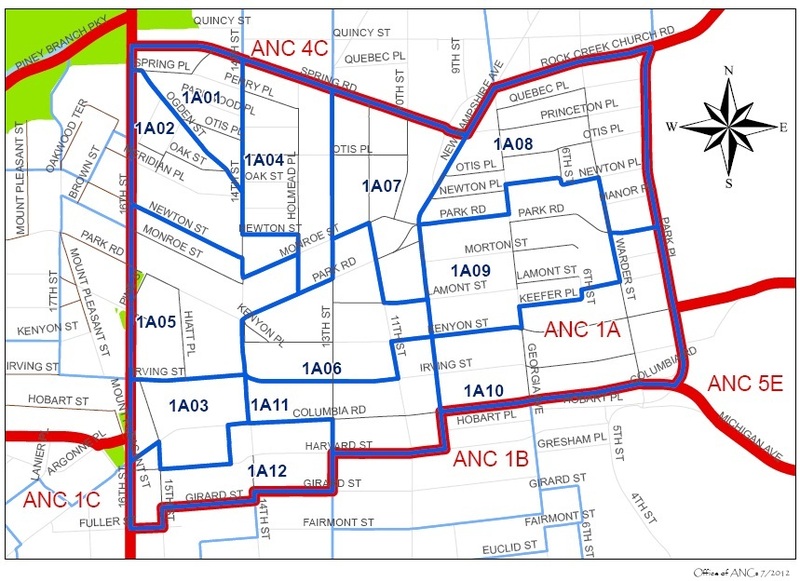 November ANC1A Election Will Have Three Competitive Races. Yesterday was the deadline to turn in nominating petitions for those wanting to be on the ballot in the November Advisory Neighborhood Commissioner races. Based on information from the Board of Elections posted this morning, the following are the candidates that will be on the ballot (presuming there are no successful challenges to qualifying signatures). One Single Member District is open, with no candidates on the November ballot. This seat could easily be won by any interested write-in candidate. The map below shows where the Single Member Districts are located. Nominating petitions for those interested in running to serve on an Advisory Neighborhood Commission became available on July 11th and must be turned in at the Board of Elections by close of business on August 10th. 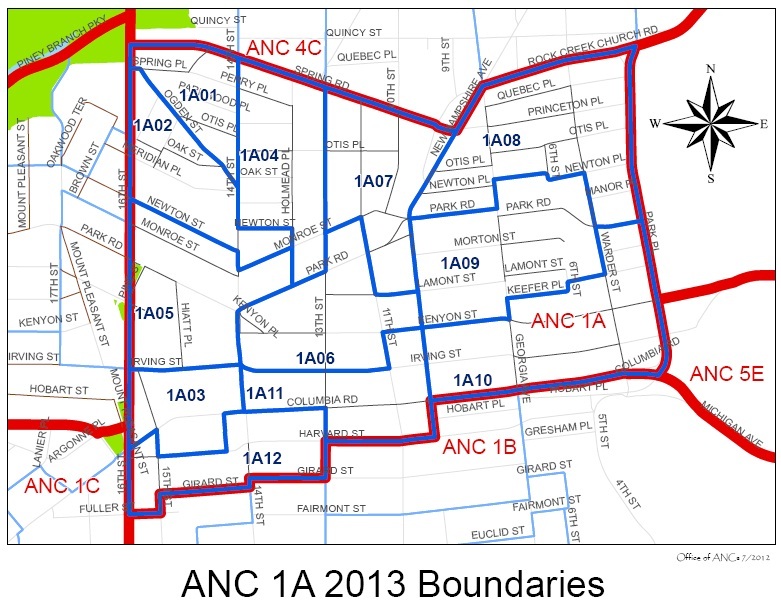 As of July 27th, there were still four Single Member Districts within ANC1A where no one had picked up petitions yet. The SMDs in question are 1A02, 1A03, 1A11, and 1A12 (see map below). All of these SMDs are in Columbia Heights. In five of the SMDs (1A01, 1A05, 1A06, 1A08, and 1A10), only one candidate is currently circulating petitions. Interestingly, three SMDs show potential for having a competitive race this November — 1A04, 1A07, and 1A09. Below is the current list of potential candidates as of yesterday. Following the May meeting of ANC1A, Commissioner Thu Nguyen (1A05) stepped down to move to Philadelphia. This vacated her seat on the Commission and two candidates have stepped up with hopes to fill that vacancy — Christine Miller and Oliver Barham (Borderstan has a nice profile of them here). Miller and Barham will face off in a special election scheduled for July 13 at Harriet Tubman Elementary School’s gymnasium (3101 13th St. NW) during ANC 1A’s regular monthly meeting. Polls will open at 7 p.m. and close at 8:30 p.m. Voting is open to all registered voters who live within the ANC 1A05 district. Coinciding with the Special Election, Commissioners (and anyone) interested in serving on the ANC during the next term will need to pick up nominating petitions. The Board of Elections (BOE) will make petitions available beginning Monday, July 11th. The petitions, with the usual 25 or more signatures of registered voters in a Single Member District, will be due at the BOE office by the close of business on Wednesday, August 10th. 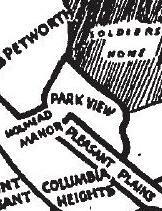 I’m including a map of ANC 1A below that shows the Single Member Districts including the location of the vacant 1A05 area. (Single Member District 1A05 is on the western side of ANC1A along 16th Street). The Georgia Avenue Community Development Task Force and Park View UNC are hosting a candidates forum for the Democratic At-Large primary race on Monday, May 9th. If you want to know some more about the candidates who will be participating in the forum, the Petworth News blog posted a conversation with Robert White, and you can check out the campaign Website of David Garber. I wasn’t able to find a current campaign site for Vincent Orange, but you can check out his At-Large Council site here. We are in the process of selecting the questions for the forum. If you have issues pertaining to Lower Georgia Avenue that you would like to see addressed at this forum, please send an email to Sylvia Robinson at sylvia (at) ecacollective (dot) org or call her at (202) 462-2285. 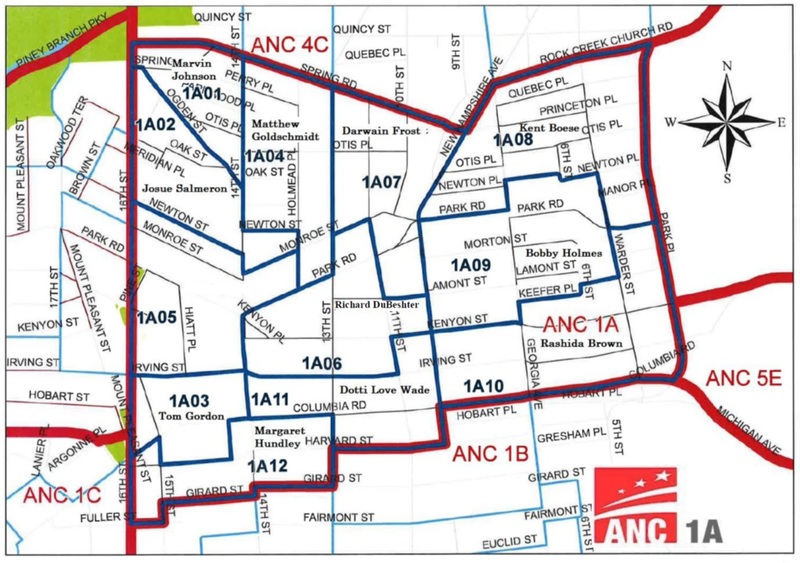 Map of ANC 1A showing borders and locations of Single Member Districts (SMDs). It’s been a week since the general election, and I finally know who all the commissioners will be for ANC 1A in the 2015-2016 term. 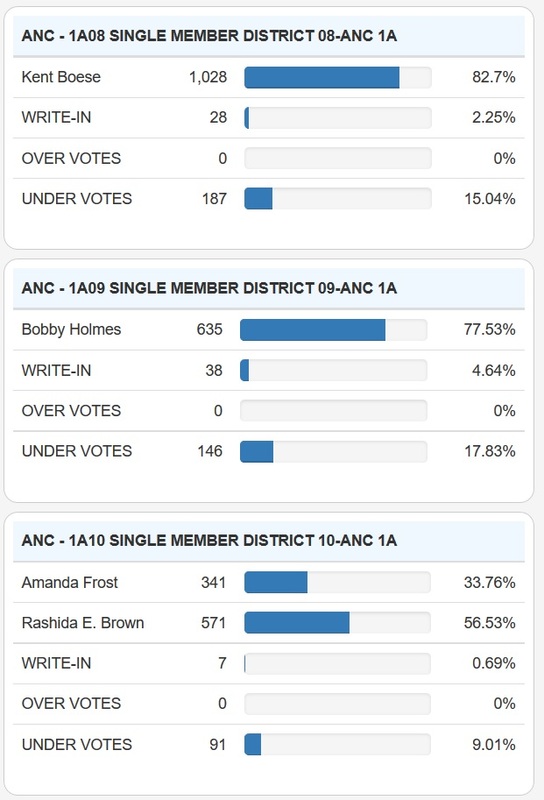 While the DC Board of Elections is still counting absentee and special ballots and official results have not yet been released, the races for ANC 1A had wide enough margins where any changes to the vote count will not change the outcome. This wasn’t true for all ANC races this year, where five races ended with a vote difference no greater than 3 votes making them too close to call and pending the outcome of the official results. In addition, there were two Single Member Districts in ANC 1A where no candidate appeared on the ballot, but where there were successful write-in candidates. I’ve recently learned who won in both of these races, meaning I now know the full list of who will be on the Commission come January. The list of ANC 1A Commissioners for the 2015-1016 term is below. Those in bold are returning from the current term. I’ll do my best too get some biographical information on all of the incoming commissioners soon. Below are the unofficial results from the general election. On Monday, October 20th, early voting began in Washington for the offices of Mayor, several councilmember seats, members of the school board, and several others races. This week, early voting began at One Judiciary Square (441 4th St, NW) and will continue through November 1st from from 8:30am to 7pm, (Closed on Sunday). All DCBOEE early voting locations will operate starting on Saturday, October 25, 2014 through Saturday, November 1, 2014, from 8:30 am to 7 pm; excluding Sunday, October 26, 2014. A sample Ward 1 ballot is below.